Anna Bonus Kingsford (b. September 16, 1846 in Maryland Point, Stratford, Essex - d. February 22, 1888 in London) was one of the first female English physicians, after Elizabeth Garrett Anderson. Kingsford participated in the Theosophical movement England and was best known as an advocate of women's rights, anti-vivisection and vegetarianism. She obtained a medical degree in Paris in 1880. 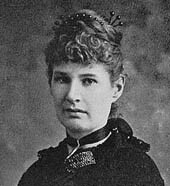 In 1883, she was made President of the Theosophical Society. She promoted a Western, Christian and Hermetic esotericism that diverged with the Oriental esotericism of H.P. Blavatsky. Kingsford claimed that she had received mystical insights in trance states and in her sleep. Her "revelations" were collected from various manuscripts and pamphlets by her collaborator Edward Maitland, and published posthumously in the book, Clothed with the Sun. She participated in many of the counterculture movements that occurred in the second-half of the 19th century, resulting from new discoveries in medicine and science. She attempted to combine her strong spiritual tendencies with new ideas like evolution and cellular biology. Subject to ill-health her entire life, she passed away at the young age of 42 in 1888. Her life and works have gone virtually unstudied since Maitland's lengthy biography, "The Life of Anna Kingsford."